Nanjaboy feature interesting contents on uniquely diverse subject that have to do with you and yours. The African Development Bank is prompting Africa’s youth to think about how the fourth industrial revolution will shape the economies, jobs and lives of tomorrow by putting pen to paper and enter The Africa of my Dreams writing contest which aims to reinforce the Bank’s commitment to Africa’s youth and bring their voice and perspective into discussions of the continent’s development. Participants must be a national of one of the 54 African countries. By recognizing the energy, creativity and innovative thinking that they bring to the table, the Bank aims to encourage the youth to reflect on the pivotal role they play in the development of their countries and the continent. It is expected that the population of the youth will double from the current 480 million to reach 840 million, by 2050, and Africa will be the youngest continent in the world. Accelerating Africa’s development through industrialization is also one of the Bank’s strategic priorities, the High 5s. The rise and diversification of investments in the continent as well as the structural factors that have contributed to its sustained economic growth, such as demographics, growing internal markets, urbanization and technological developments, represent a driving force to accelerate the Africa’s industrialization. Leveraging the youth’s innovative and creative potential can play a crucial role in industrializing Africa. Check here for more information on The Africa of my Dreams writing contest, including its requirements, rules and regulations, and prizes. You asked for it, and you got it, as Konga presents to you the assembly of the unbeatable- Festival of Discounts sale online on Konga.com. Here are some of the top categories and products to look out for in the Festival of Discount sales. Are you looking for maximum entertainment at pocket-friendly? 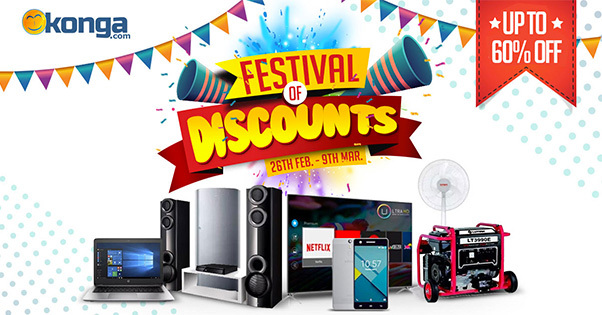 Enjoy up to 22% off electronics such as televisions, home theatres, portable wireless Bluetooth speakers, games and consoles, and more all from top brands like Sony, Hisense, Samsung, LG, Polystar and more in the festival of discounts sale online on Konga.com. Now you can get the smartphones of your choice, from the high-end brands to the mid-range brands at unbelievable lowest prices. Enjoy up to 25% off smartphones from brands like Apple, Samsung, Tecno, Nokia, Infinix, Innjoo and more. Get up to 18% off generators and other power solutions like inverters, solar panels and stabilizers in the ongoing Festival of Discounts sale online on Konga.com. Explore our huge range of power solutions from top brands like Mercury, Elepaq, BlueGate, Tec, Prag, Century and more. Whether you need a laptop for home or office, you can be rest assured of getting just the perfect laptop and accessories that specifically suits your needs. Enjoy up to 23% off laptops from top brands like HP, Innjoo, Lenovo, Dell and more. Also find computing accessories such as printers, USB cables, external hard drives, laptop replacement batteries and more. Explore and enjoy 35% off our wide range of the best home and kitchen appliances like refrigerators and freezers, washing machines, rechargeable standing fans, air conditioners, gas cookers and more from top brands like Scanfrost, QASA, Binatone, Andrakk Polystar, Hisense, Nexus and more. Don’t miss out on the Festival of Discounts online on Konga.com starting from February 26th to March 9th 2018. One winner down and four more to go! How would you like to go on an all-expense paid trip London? Now you can because Konga and Lumia says so. When you buy the Lumia 540 Dual Sim or the Lumia 640 XL Dual Sim or any other Lumia on Konga.com, you’ll stand a chance to win an expense paid trip to London, England! Our first winner was Kingsley Obodo. You can be among the next winners before the end of August 2015. How does this work? Follow these easy rules. Winners will be picked based on the most creative entries. 5 tickets of an all-expense paid trip to London, England waiting to be won! This competition is open for purchases made from June 24th – August 31st 2015. Think of all the fun things you could be doing during an all-expense paid trip to London. Waste no time, click here to start the challenge! Terms and Conditions apply. Visit the Lumia Store today! A king may move a man, a father may claim a son; But even when those who move you be king or nobles, your soul is in your keeping alone. When you stand before God, you cannot say that I was told by others to do so or that virtue was convenient. This will not suffice.